In 2014, the Pioneer Valley Planning Commission and Live Well Springfield recruited bicycle and pedestrian advocates from around the city to be part of the development of a Complete Streets plan for the city. As the process wore on and movement on the implementation of the plan stalled, those residents opted to take a look at what they could do themselves. “All the while our group was meeting and looking at a map of Springfield and realized that without a lot of work we could send a message that Springfield is a bikeable and walkable city,” explained organizer Betsy Johnson. And with that, Better Biking and Walking for Springfield embarked on a mission to make residents more aware of the biking and walking options available around the city. After a successful community bike ride in the fall of 2016, the group has taken on a goal of hosting monthly rides in different sections of the city to encourage biking as a viable option for getting around. Rides, which take place the first Sunday of the month, are open to any kind of rider. For the May ride, the group started at Benson’s Bagels on Sumner Avenue and made their way through the Metro and Metro North areas via a route that took them through Six Corners, Chestnut and Dwight Streets, past Union Station, onto the Connecticut River Walk and Bikeway and the Springfield Museums. The June ride, slated for June 4 at 1 p.m., will explore the Bay, Old Hill and McKnight neighborhoods. That ride will feature two starting points – Benson’s Bagels at noon for a 15-mile ride or Central High School at 1 p.m. for a seven-mile ride. 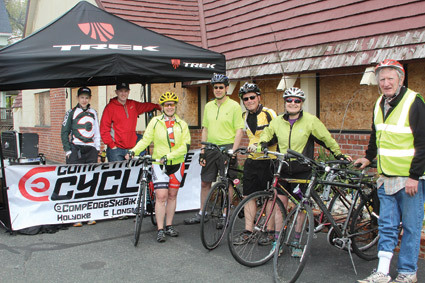 “Competitive Edge has kindly offered their support at the start of the ride. They’ll take a quick look at your bike, check the tires and make sure you’re safe to ride,” Huber noted. Better Biking and Walking for Springfield, an all-volunteer organization, also meets monthly at the Forest Park Branch Library to not only discuss future rides, but also educate on potential improvements to the city’s roads and sidewalks and discuss ways they can advocate for additional safety options. Johnson noted the city has made some advances in travel safety and has plans for others, pointing to the improvement plans for high-crash intersections at The X, Six Corners and the Island Pond Road intersection by the General Edwards Bridge. Other initiatives, she added are simple and would not be nearly as expensive. “We want to help the city think about things like when they’re repaving streets, they don’t have to put the shadow line back at the edge of the road; you can make 11-foot travel lanes and slow down traffic and even if it’s not a full bike lane, it makes it safer. That’s what they did on Bay Street last year and it’s made a difference for folks coming that way,” she said. She also noted the city’s Health Department has performed audits in conjunction with Walk Boston around schools and neighborhoods and other high-pedestrian traffic areas such as the Hungry Hill Senior Center to assess the needs for improvements to sidewalks and lighting. In addition to the June 4 bike ride, the organization intends to make a statement at the grand opening of Union Station with groups converging on the revitalized transportation hub from different areas of the city on bicycles and on food, including Sumner Avenue, the Chicopee city line and the North End. “We want demonstrate how easy it is to walk and bike to the station,” Johnson said. For more information on Better Biking and Walking For Springfield, visit the group’s Facebook page at www.facebook.com/BikeWalkSpringfield or email BikeWalkSpringfield@gmail.com.